The Communal Project series will document my setup of a Moncentropus balfouri communal, starting with the planning and acquisition of both the enclosure and tarantulas and continuing through as they mature. You can read the other installments of this series by clicking the following links: “Communal Project Part 1: An Enclosure by Brooklyn Bugs.” ; “Communal Project Part 2: Nine M. Balfouri Slings” ; and “Communal Project Part 3: First Week’s Observations” . As time has passed, I’m still finding myself completely captivated by the feedings. At first, I watched my slings eat with equal measures of apprehension (I couldn’t help but to worry that one would attack another) and fascination (They WEREN’T attacking…they were getting along just fine!). Years of keeping tarantulas had me hardwired to think that any spider-to-spider contact would inevitably result in only one fat spider. And, having personally observed thousands of feedings, I had a great appreciation of just how powerful a tarantula’s feeding response could be. I’ve seen spiders launch themselves at the slightest vibration on their substrate. How would they be able to override their hard-wired prey response in time to recognize the difference between prey and a hungry sibling? However, now that we’re deep into month two, it appears that my fears are completely unfounded. I’ve now witnessed about a dozen feedings, and there hasn’t been any friction. The most “contentious” episode I witnessed involved two sling that were feeding on the same piece of roach. After a short tug-of-war over the carcass, they both broke pieces off, then calmly sat and ate their meals. Many times, I’ve caught up to five, legs intertwined, peaceably feasting on the same prey animal. It’s something I wouldn’t have believed if I didn’t see it myself. These little guys are eating machines! One thing that has truly impressed and surprised me is just how much these little guys and gals have been eating. I’ve been offering them three pre-killed red runner roaches or crickets three times a week. Although I’ve tried introducing live prey into the enclosure in the form of red runner roaches, they’ve shown no interest in them. If I drop a prekilled roach or crickets in front of the burrow entrances however, they are usually on it within the hour. I know that, in the wild, the mothers prekill prey and leave it for their spiderlings to eat, so I’m left to wonder if this is an instinctual behavior for them. Although the three times a week feeding is obviously an ambitious schedule, I wanted to make sure that the slings were well fed to prevent any possible cannibalism. It was also a bit difficult to discern at first what size and portions to offer nine .75″ slings. I began by offering one large roach, which they decimated in less than an hour. I then started giving them two. Both were gone the next morning. For the past couple weeks, I’ve been giving them three, and that seems like it will work for the time being. However, they’ve all just molted, so I’m assuming that I might have to increase the amount I give them soon. It should be mentioned that it’s been a rather warm summer, and temps in the tarantula room have routinely been hitting 80° and slightly above, so this might have jacked up the little guys’ metabolisms. That said, the last three specimens I kept and that were in separate enclosures didn’t eat well even during the hot summer months, so I have to consider that the appetites might be partially due to the group dynamic. Unfortunately, all I can do is speculate. As I’ve had the fear of cannibalism in the back of my mind, I’ve been pretty obsessive about counting the slings every time they are all out. Well, starting two weeks ago, I was only able to count eight at any given time. At first I just suspected that one was always hiding in a burrow, which made it appear that there were only eight. However, as more time passed and I failed to ever catch all nine out, I worried that the ninth had possibly died. I honestly didn’t suspect cannibalism, as I had never witnessed any friction between the slings. I did, however, worry that there might have just been a weak sling that wasn’t destined to make it. Well, shortly after posting a YouTube update on the communal and mentioning that I was missing one, I caught all of the slings out and about again. This time, I there were clearly nine present. Apparently, they were all still doing just fine. Another unique behavior I’ve witnessed is something I’ve been referring to as the “spider pile”. Many times when the slings emerge to sit on the surface, they huddle together into one large tangle of bodies and limbs. It’s really something to see, and I was fortunate enough to catch one of these events in the video below (it’s after the footage showing all nine of the slings). Now, they don’t always assemble into a spider pile when they are out; often, they all just sit next to each other along the wall on the top edge of the webbing. I’m not sure what purpose this behavior serves, but I’ll definitely look forward to seeing if it continues as they mature. With some of these latest developments, I feel comfortable answering a couple of the questions on my list. Do they really eat together and without friction? Although I’ll continue to monitor the interactions as they mature, I’m comfortable in saying that YES, the slings do eat together without conflict or issues. I’ve personally witnessed a dozen feedings and I’ve seen no aggression between the slings. 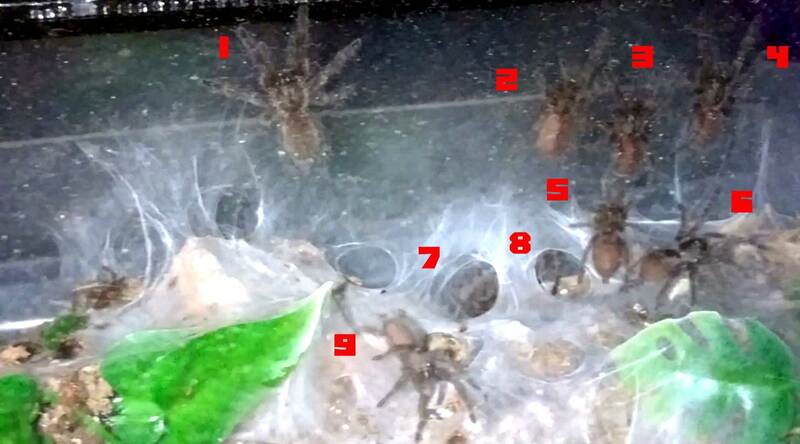 Do M. balfouri slings kept communally eat more and grow fast than those kept alone? Right now, the answer appears to be a YES. The new slings have already molted at least twice in my care, and they have been eating as much as I’ll give them. This is in sharp contrast to the first three I kept that were very finicky and sheepish eaters. As always, I will continue to make updates and post whenever something interesting occurs! ← Tom’s Big Spiders – Logo Poll! 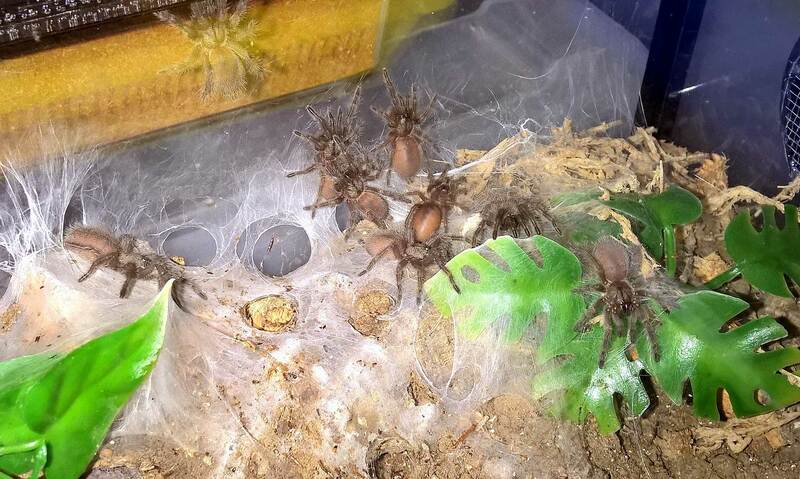 One day, I will have a commune of some kind – probably either M. balfouri (because I love my little juvi, who appears to be female) or P. regalis (I have a male regalis, possibly mature now but don’t see enough of him to judge). I briefly considered an OBT commune, but decided that could only lead to Fat Spider Syndrome; I know some OBT communes that have been successful, but not many! I’ve been having some pretty rotten luck with my spiders lately, sad to say. The heat has killed a few of my slings, and the beautiful AF P. fasciata I picked up from BTS in May suffered a wet moult, which really upset me. If I’d only seen the crumpled mess she was before she died (she was in hiding) I think I would have put her in the freezer for sure. She’s there now because I’m sending her and her moult to a friend who’s researching hybrids and just really into arachnid taxology. In better news, days after finding my poor fasciata, my columbia moulted successfully (which I really needed after that horror!) and two of my smaller slings moulted yesterday (G. porteri and L. kugi: second time for both since I’ve had them). The communal setups have fascinated me for year, so I’m glad that I finally got the opportunity to try one out. This has been an incredibly fascinating little project so far. I’m so sorry to hear about the deaths…that’s terrible. Is it particularly hot there this year? I’ve seen photos of wet molts, and they look absolutely horrible. UGH.God, I hope I never have to go through that. Congrats on the successful molts, though…that’s great! Poor Servalan looked as thugh all her legs had been broken. I left her for the usual week before alarm bells began to ring and I asked my husband to go in and move the bark so we could check her, and when I picked her body up she was still wet, so she never stood a chance. It’s definitely been hotter than usual here in the UK, which accounts for the sling deaths and the mould in one sling’s enclosure (I immediately made up another home for it and brushed it in – it moulted fine a week later). The lividum was easier than expected! She dashed up my arm and rested for a bit, then ran onto my back and so I had to ask hubby to finish the job, but she never once tried to strike me. Unlike the MM OBT I’ve just spent three days attempting to pack for a friend: we got him as far as my slipper last night so tonight we’re going in again (at least I know this OBT isn’t broken). I’m just lining the pot with kitchen towel though – beyond that, hubby gets my advice, a paintvrush and a pair of tongs and he’s on his own lol. I’d do it myself because I know I would have had more luck, but for me heat equals epilepsy, so I’m not risking this male’s safety.